Click here for the Litblog Co-op podcast, interviews, analysis, and discussions about Sabbath Night in the Church of the Piranah. 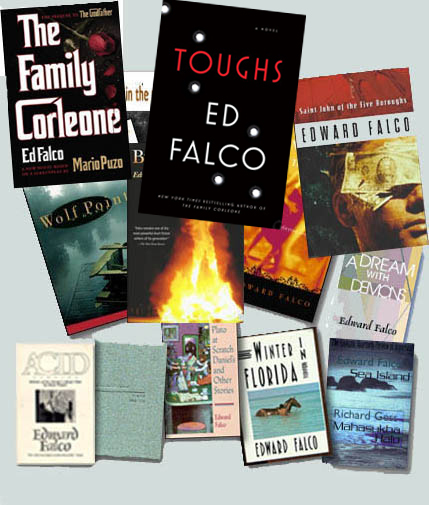 Precarious and dramatic, filled with dynamic characters who are challenged by intense situations, Edward Falco's stories haunt a reader's mind long after he or she closes the book. Falco crafts character and setting with such skill that otherwise unbelievable events ring true and live beyond the pages of his fiction. . . . a collection that cannot be ignored. Edward Falco writes with passion and honesty, chipping away at all forces dark, violent, and profound. 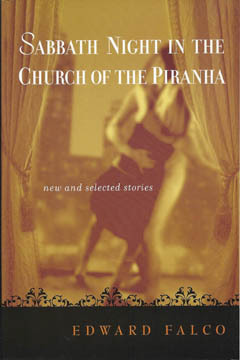 Edward Falco, in his collection of short stories, Sabbath Night in the Church of the Piranha: New and Selected Stories, stylistically recalls the grotesque of Flannery O'Connor, the economy of diction of Ernest Hemingway, and the 'Dirty Realism' of Raymond Carver, with stories that hauntingly expose the grit and challenge of the everyman and everywoman -- characters who are us at the most primal of levels, but who are, too, the freakish darker parts of we who would only imagine doing or enduring what his characters endure and do. As one might surmise from Falco's titles, he is an original and vivid writer. In this outstanding collection, Falco excels at depicting the darkness that lurks within, yet he addresses this gritty reality with a soaring lyricism. His fans will relish this collection. Readers unfamiliar with his work…will remember Edward Falco's name from now on…His prose is alternately haunting and tender, comforting and disturbing. Edward Falco's writing beautifully explores the lights and shadows of human existence. Falco brings a remarkably tender voice to a distinctly male collection of stories. One of those rare short story collection that you read straight through, rarely even setting the book down. Falco is a master of hooking the reader into the story with a tantalizing first sentence: "First, a teenage girl flashed me at a Marilyn Manson concert." "Couple of years ago, Connie came home from work to find Doug, her second husband, swaying in nine feet of water like an aquatic Frankenstein, cement-filled milk jugs tied to his ankles...". To paraphrase the old potato chip commercial, I'll bet you can't read just one. Four stars for this collection. Falco's stories have authority, unhurried pacing and a quiet confidence that I admire. These are male stories—some are men behaving badly, while others are men trying to escape the past and find a place for themselves in the world. Boys and men, all. But within this sphere, Falco is at the top of his game, delivering fine clear writing and a masterful understanding of short fiction. Long after the book is finished, these people stay with the reader, haunting, making the reader uncomfortable by suggesting that all people are represented here. What more can you ask of a writer than that? Compelling…Falco shows a deft touch at keeping his characters empathetic while maintaining their occasionally disturbing flaws. [Falco] draws the attention of a highly literate audience through his graceful use of language…[and] provides any reader with both compelling plots and engrossing characters.